Spring is in full bloom once again! Just in time for the Easter festivities. And just in time to release this new free plush Easter Bunny sewing pattern! These mini plush bunny dolls are so fun to make and adorable too! Whip up a pile of plushies in mere hours! Each fleece bunny takes around an hour and a half to create. The bunny dolls are made up of super fuzzy fleece and wool felt. This pattern is design for hand sewing, however the fleece bodies will work up fine with the use of a sewing machine and a careful stitch. Printable PDF Bunny Sewing Pattern! This pattern is available as a free instant download! Print the pattern from your home computer to sew up your very own Easter bunny plush whenever you may want to! The bunny sewing pattern will come to you in the form of a digital PDF file. Open the file in a separate window and save to your desktop for later use. Or print it immediately and start your project! How To Sew Your Own Mini Easter Bunny Plush Dolls! For full instructions and diagrams to sew your own plush Easter bunny doll, download my printable bunny sewing pattern PDF file. The materials needed to sew this project are inexpensive and minimal. The finished product fits in your palm! You can even make these small plush bunnies from fabric scraps! Felt sheets and fleece can be found online and in most fabric shops. Or message me and I can put together a custom sewing kit for you, complete with fleece and dolls eyes! 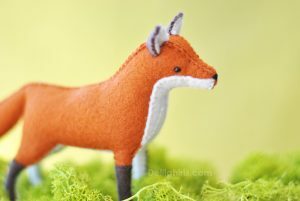 Check Out My Newest Fuzzy Jointed Animal Patterns! Don’t forget to check out my other Bunny and Easter/ Spring themed animals and dolls! I’ve got animal and doll sewing patterns, and even DIY craft kits! Valentine’s Day Craft – Hand Stitched Heart Felties DIY Tutorial! If you’re looking for a fun Valentine’s Day craft to make then look no further! These palm sized, Hand Stitched Valentine’s Felt Hearts are so fun and easy to make! The finished results are insanely adorable! These little hand stitched felt heart dolls make for fun and cute handmade gifts, or even as a decoration. Add a string to make them as ornaments! They could even go on a cute kawaii necklace! These felties really are super easy to make! I’m going to show you how to re-create this Valentines Day craft just how I did, with alternative no sew instructions for kids and those who’d rather not have to sew. But I promise – even with all the hand stitching, these are fast to make. Begin by cutting out a pile of felt hearts. These could be cut by hand, or you can use my quick printable heart feltie pattern to trace the heart shape onto the felt. Each Valentine’s heart feltie will need 2 equally sized, heart shaped felt pieces. Next you’ll want to give your heart felties some character! I chose to use doll safety eyes, and embroidery thread to create the facial expressions on my dolls. For a quick and easy way to add faces try using fabric paint or markers instead! Fine tipped sharpies work magic as well! To add arms and legs to the hand stitched heart dolls you will sew some pipe cleaners into the middle of the dolls. I sew mine in place by sending the needle halfway through the width of the felt. This way you can hold them into place inside of the doll without seeing any stitching on the outside of the felt. For a super fast way to complete this step, use fabric glue or a hot glue gun! Sew the two layers of heart shaped felt together, with the pipe cleaner arms and legs sandwiched between the layers. Sew all the way around the outer edges of the heart until there is a small opening left. Use the opening to fill the inside of the heart with stuffing. Once the heart feltie is stuffed full, sew the opening shut. The last step to finishing the valentines heart felties is to create finished the arms and legs. Trim the arms and legs to a smaller size using sharp scissors or wire cutters. Bend the bottoms inward to create small loops as hands and feet. Viola! You’ve create an adorable Valentine’s Day Craft project to share with your friends and family! Have you created felties with my handstitched felt heart Valentine’s Day craft? I would love to see your creations! Feel free to share on social media, or email me pics of your work! For more free patterns and Valentines day craft swing on over to the Free felt sewing patterns page. New This Month – DIY Stuffed Hedgehog Printable Sewing Pattern! I’m excited to announce the release of my newest PDF pattern! Its a felt and faux fur Stuffed Hedgehog Pattern! These little critters are so fluffy and precious! I created mine with extra fluffy and long faux fur. But you can create them in any color or fur style you want! There in lies the beauty of DIY! Make your own woodland plush stuffed animals with my printable PDF Hedgehog sewing pattern and tutorial available here! I do hope you enjoy my hedgie pattern! Suzy Pocket Doll Sewing Kit! I’ve begun revamping and creating new DIY craft kits with updated boxes, materials, and patterns! This suzy kit is the first of it’s kind with a printed cloth dress. These little dollies are so sweet! A perfect pocket companion or dollhouse doll. And these kits make for a wonderful gift! For now the kit is available in my Etsy shop, but keep an eye out as I add it to my DIY Craft Kit lineup. As always, don’t forget to follow me on social media! Post your best pics of your handmade creations on Instagram and Facebook. Don’t forget to tag #Delilahiris so I can see and share your handi-work!